On Saturday, two 6.1s, Taran Llewelyn Bradford and Thea Sesti, took part in a pilot scheme to bring ‘QI Thinking’ into education. Bedales is hosting this pilot, and is working with six other independent schools. The hope is to develop an approach that can be rolled out into classrooms in both the independent and maintained sectors, building inquisitiveness. QI stands for ‘Quite Interesting’. You might have seen it on TV (this clip on ‘what is the roundest thing in the universe?’ is quite representative, if you haven’t seen it), but actually, its creator, John Lloyd has a much broader, and idealistic aim for QI than that. QI is not only about TV, but also books, podcasts, talks to industry leaders. In short, QI is not a show, but an approach to thinking and learning. Parents might remember that we hosted John Lloyd ‘in conversation with…’ Harry Enfield in aid of the John Badley Foundation. There is clear overlap between QI’s focus on inquisitiveness, and Bedales’ first aim to ‘To develop inquisitive thinkers with a love of learning who cherish independent thought’. Because of this, Headmaster Keith Budge, in his role convening the HMC conference this year, worked with John to formulate a scheme for ‘QI boot-camps’, designed to reinvigorate curriculum with interesting, fascinating facts, rather than dull, obvious material. John Lloyd argues that ‘nothing is boring if you spend enough time looking into it’. On Saturday, this was modelled for us. John, and two of the ‘elves’ Anna Ptaszynski and James Harkin, demonstrated, pretty conclusively that there is something fascinating, even about a topic as seemingly dull as fire-escapes! In the afternoon, we spent our time in our wonderful library, with both online and paper resources (books, periodicals and newspapers) at our disposal. Students had to seek out anything fascinating relating to a ‘Q’ word (the elves are currently compiling material for the ‘Q’ series of QI). Look out for these facts we discovered! Did you know that Tyrannosaurus Rex actually had feathers? Did you know that when The Prophet Muhammad’s (pbuh) followers were exiled from Mecca, they used to pray facing Jerusalem? Did you know that there is a disease that humans can get from eating a quail that has eaten a poison, even though we would not get ill from directly consuming the poison? Taran and Thea will now be working as ambassadors for this approach in the school. Look out for prompts for QI thinking in the next few weeks! On Wednesday, Bedales held an education conference as part of its series of ‘leading independent thinking’ events. Two years ago the subject was innovative education, whilst this one focused on leadership. These are, arguably, the two most important facets that the ‘industry’ needs to address in the early 21st century, a time when traditional educational models seem to be breaking down and the respective authorities seem unwilling, too-slow or even incapable of making the changes required – a theme that very much came out of the day. Kick-started by a keynote address from Chief Inspector of Schools and Head of Ofsted, Sir Michael Wilshaw, the title of this year’s conference was ‘Liberating Leaders’. The day was designed for people across both age ranges (student and teacher) and did what it said on the tin! At least that’s my experience given that, writing this the next day, I now find myself feeling a breeze of liberation which has seemingly put me on a track that I was struggling to find. This article is the first of several, in it I will provide an introduction to the day, the speakers and the initial effect on me. In later articles I will discuss the messages of each speaker, my thoughts and inspired actions. As you may have guessed, Bedales, a school with a long history of innovation, did not stick to the educational-conference norms, with one speaker pointing out that this was the first one she had been to that involved students as well as teachers. Later in the day, the conference split into two programmes, with the students splitting off to take part in leadership workshops. They later re-joined us for the educational debate. Below is a brief account of each adult session. That knighted rebel, Sir Michael Wilshaw, started the programme of events and called for more “Mavericks” in state education. He defined ‘Mavericks’ as being extraordinary, flamboyant, colourful and slightly strange characters. Characters have long been a traditional facet of the independent sector but largely lacking in the state sector. He went on to give examples of what sort of characters these Mavericks might be, giving several real life examples from his own experience (he’s a lucky Knight to have been exposed to such a rarity). He then went on to talk about the ‘act’ that these Mavericks need to put on, to facilitate a good education. However, I got the sense that Mike’s idea of a good education is different to mine. For him, it seems, a good education is about tradition, imperialism, discipline to authority, GCSEs and A-levels, and this is where the Mavericks in him and me vary. Mike is, what I would class, a pseudo-maverick, a traditionalist who uses un-orthodox measures to achieve orthodox aims, whereas the Maverick in me is less of an oxymoron. I am the type of Maverick who believes current education is inadequate and that we need major changes in-line with the modern world, instead of measures that attempt to hold on to imperialistic values of a once ‘great’ Britain. Thankfully the room was largely full of delegates who had a similar vision to mine, as final questions and Twitter revealed. Moving on we heard from some other Mavericks who are doing great things in schools. Firstly, two scholars from the States (where education is much less restricted by government) gave two extremely inspiring talks about their Maverick journeys. Barbara Oakley talked about her inspirational story in education and ‘learning to learn’, turning academic research into tangible metaphors, thus delivering exemplary content. Danielle Harlan gave some entertaining anecdotes with strong and powerful underlying messages that have helped shape her into the Maverick leader she has become. In her second year of teaching, she was able to get her Special Educational Needs (SEN) class up to either the peer-group’s grade or above, simply by redesigning the curriculum in small but measurable increments. After lunch, complete with Bedales sausages, focaccia, chilli chutney and onion jam – all produced by the Outdoor Work department – we heard from Bill Lucas -a Maverick, pioneer and founder of the Expansive Education Network. It seems to me that Bill’s contributions to education already surpasses the Knight’s, but whilst Bill was involved in British education during Labour’s tenure, the Conservatives have sent him to the ’naughty corner’. Nowadays, or rather ‘nowayears’ and despite being based at Winchester University, the Welsh Government is the only political force in the UK that seems to value him; internationally, he is dealing with the Australian Government as well as many other schools around the world, including England! Bill gave his 14 top tips for improving future education that left me dreaming of a rational world in which our political leaders understood the needs of the people. Next, we heard from three Maverick Headmasters, two from the state sector: Geoff Barton and Mike Fairclough, as well as Bedales’ own, Keith Budge. Geoff, who bravely called Ofsted a “Monster”, took to the stage first. It was a shame that Sir Mike had already left the building, as I feel he needed to hear Geoff’s extremely good argument about the problems of Ofsted’s model of inspection and the bullish role it has in education. But I doubt Geoff would have had much of an impact, the Government does not always respect the opinion of stakeholders such as professional educators – as Gove proved with his A-level reforms. Moving on, Mike Fairclough’s story was my favourite, he is so Maverick he’s off the scale! With his innovative school, containing a farm and a Bronze Age site, where they make arrow heads, use paddle boats, learn country management skills and have a partnership with the Health and Safety Executive (HSE) that aims to dispel media health and safety myths (how ironic that HSE takes more of a supportive role than Ofsted). But what really brought a tear to my eye was the fact that this was done on a council estate, a demographic in which education is known to fail. Finally, and being left short of time, Keith concluded the talk by discussing the recent innovation that is the Bedales Assessed Course (BAC), giving the audience an insight into the history of the BACs, what they have taught Bedales, and our future aspirations for them. To close, there was an educational panel debate involving Keith, Geoff and four students: Flora and Charlie from Bedales and two girls from King Edward VI School. I must say I was particularly impressed by the ability of all four students to talk intelligently and respond so well and quickly to questions they had only just heard. The debate was not only a nice close to the day but also highlighted to me just how lucky I am to be able to work in an institution that creates free, open-minded and independent adults – something we do here, we are certainly doing right. View speaker’s biographies and presentations from the conference here. An important aspect of the work of the Bedales Professional Guidance Department, which I lead, is to be alert to changes and trends within higher education. For example, there has been a trend in recent years for university applicants to be admitted on lower grades than those expressed in offers which, in turn, has seen us advise students on their applications and make them aware of incentives from some universities to those applicants making them their first choice. This is part of our extensive engagement with students over the choices they make concerning their working lives beyond the school, wherever their preferences may lie. An interesting new development has been the rising enthusiasm in UK universities for more American-style liberal arts degrees which, initially at least, see students pursue a wider range of studies than tends to be the case here. This comes against a backdrop of increasing interest amongst Bedales students in studying in the US and Canada. They appear to value the additional flexibility that this offers them, and the fees, whilst typically expensive, have not appeared quite so steep subsequent to the increases to those in the UK. European universities are also opening up to English students, who can expect liberal arts programmes to be taught in English, and are extremely well supported by their institutions. However, over the past few years a number of UK universities have launched modular liberal arts degrees, all of which offer students the opportunity to study a combination of major and minor subjects rather than straight single honours programmes. The most recent of these, offering extensive subject choices and significant flexibility, is from Leicester University. After the first year students can upgrade their minor interest to joint honours, or can even change to single honours should they so wish. It is the most flexible of the liberal arts degrees I’ve seen here, and I think many Bedales students – although not all – will find it attractive. When I interview Bedales students during the 6:I year as they begin to consider their UCAS applications, some are very sure about what they want to do. Many don’t know, however, and so find it very hard to choose – a significant factor in some electing to study abroad. Now, it seems, they may be able to find such a programme without leaving these shores. As with everything, there are potential drawbacks as well as advantages to this route. They are not for everybody, and those who are clear about their direction are likely to be better served by the single honours route. We are mindful that some of our students have not enjoyed the American model but, instead, have been frustrated to find themselves unable to study some subjects in as much detail as they would like. For such courses to work well they require sound planning and management – some Bedales students who have gone on to pursue joint honours programmes have found the workload onerous, exacerbated by poor sequencing of requirements for written work. I suspect that students’ perception of such programmes as manageable will be the making or breaking of them in the long run. Certainly, I will be alerting many of our students to what Leicester and others offering liberal arts degrees have to offer, and I’d like to see more universities follow this trend and make the programmes work. Industry has been vocal in its requirement for entrants with a rounded education, and there is an increasing numbers of students seeking an education hitherto available only overseas – such programmes can serve both parties well. Of course, this does not undermine the importance of the more traditional degree programme, which remains the better bet for those wanting to specialise, or to pursue higher academic study, and we will encourage our students to think very carefully about what is right for them. Whilst educational research can be valuable, schools must be wary of investing in resulting apparently linked beliefs and practices that threaten to supplant the judgment of teachers, argues Alistair McConville of Bedales School in the current issue of the Times Educational Supplement published on 7 November 2014. ‘The sad, slow death of intuition’ in teaching discusses the growing appetite for evidence-based practice in teaching, facilitated by initiatives aimed at connecting more closely the research and teaching communities, with the former making increasingly confident recommendations as to what teachers should do in the classroom. Instead, he writes, schools should seek to understand the value of research findings in a context-specific manner, taking into account the judgment of those who have dedicated their professional lives to teaching. More fundamentally, as well as considering how students learn, he proposes that we ask: “Learn what, and to what end?” The fundamental purposes of education are not self-evidently to raise average test scores, though this is often the implicit assumption made in assessing educational ‘interventions’. Bedales has itself invested carefully in education research initiatives – notably, in partnership with Harvard academics through the Research Schools International Network. However, rather than seeking to import externally generated ‘lessons’, this work has been carefully designed to benchmark the school’s stated educational aim of ‘developing inquisitive thinkers with a love of learning who cherish independent thought’, thus rooting the research in a deeply held conviction about the nature and purpose of education, and contextualising it appropriately by drawing upon the classroom experiences of Bedales students. McConville explained: “The results were scrutinised critically by staff, resulting in a healthy debate about our collective practice: through this process we developed a better understanding of how we were doing against our own criteria, and were able to make informed changes to our lower school curriculum”. 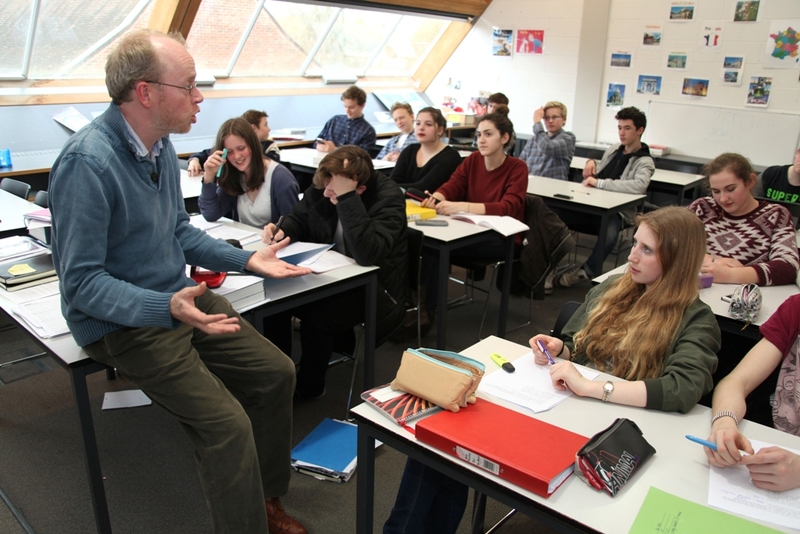 Bedales is one of a growing number of independent schools moving away from what are seen as over-prescriptive GCSEs in favour of the International version (IGCSE) and, in the case of Bedales, the school’s own BACs (Bedales Assessed Courses). Replacing GCSEs in non-core subjects, BACs encourage and reward imaginative, independent and committed enquiry, and have been welcomed by universities and UCAS. Alongside Geography Awareness Week in the US and Children in Need in the UK recently, International Education Week with the theme ‘use your voice’ gave all geographers the chance to discuss pressing issues on a variety of scales. Block 3 looked into the impacts of globalisation through technology and global brands, Block 4 explored the argument of ‘aid does more harm than good for countries that need it the most.’ For Block 5, individual interests led to research and discussion on anything from ‘China’s trail to Olympic glory’, ‘global attitudes to abortion’ and ‘(cultural) cost of wealth’. Follow the Geography department on Twitter @GBedales to see what’s happening locally through in-house initiatives like YPI and globally with tools like the Closet Calculator from National Geographic.